Within the fitness boot camp, military fitness and outdoor fitness market running plays a significant role in the training programmes of all training providers. As such, fitness professionals should have an understanding of the various, potential, injuries which can occur as a result of overtraining (typically veterans) or progressing to quickly (typically newer members) to their clients. Chronic Exertional Compartment Syndrome (CECS) is one of these potential injuries that can affect their clients, although fitness and medical professionals should be open to a differential diagnosis (discussed later). Fitness professionals, unless appropriately qualified, should not be making a clinical diagnosis of CECS and individuals should be referred to their medical practitioner. CECS is an ischaemic condition that occurs when a fascial compartment is unable to accommodate the increase in volume associated with muscle contraction and swell­ing. The increased volume increases intra-compartmental pressure and reduces perfusion of the tissues within the fascial compartment. The condition is most common in the lower leg but has also been described in the thigh, forearm (gymnasts and climbers), and foot (runners and during aerobic training). Symptoms depend on the fascial compartment affected and the nerve or structures con­tained within (Figure 1). 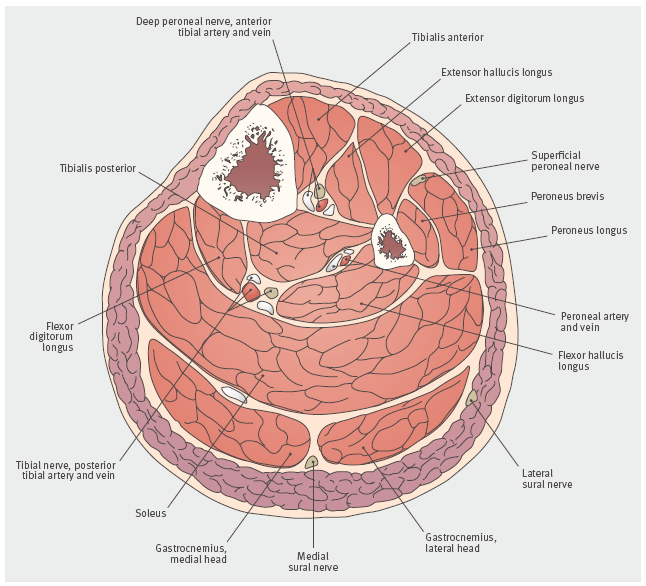 Figure 1: Cross sectional anatomy of the leg midway between the knee and ankle, including muscles and neurovascular structures in each of the four leg compartments. How Do Symptoms of CECS Typically Manifest for the Individual? An individual (male or female) with no medical history of note may present with unilateral/bilateral lower leg pain on running. The pain is typically absent when the individual starts running. Pain gradually builds after the first kilometre/mile, forcing the individual to stop. Pain resolves shortly after stopping. The individual may stop running for a few weeks in order to ‘rest’ their legs, but the pain returns when running resumes. Physical examination at rest is normal, typically with no swelling or focal tenderness. The diagnosis is often missed because individuals are asymptomatic at rest with minimal findings on physical examination and it may be confused with other conditions. For example, in a case series of 42 patients with diabe­tes who were thought to have claudication, but who had normal pedal pulses and ankle brachial indexes, 38 were found to have CECS (Edmundsson & Toolanen, 2011). Medical practitioners need to be aware of the potential diagnosis and be willing to challenge their patients with exertional tests to reproduce the symptoms. In addi­tion, CECS may co-occur with other diseases, including stress fractures or medial tibial stress syndrome (MTSS; tender­ness over the posterior medial border of the tibia related to traction from muscular attachments or diffuse overuse of periosteum and medial border of tibia), which can make diagnosis more difficult (Wilder & Magrum, 2010). The diagnosis may also be missed owing to overuse of the non-specific label of ‘shin splints’. Medical practitioners need to make a specific and anatomic diagnosis that leads to targeted treatment. When the diagnosis is missed, individuals may undergo myriad failed treatments that target symptoms but not the cause of the problem; athletes may give up their sport completely. Rarely, CECS con­verts to an acute compartment syndrome as individuals continue competing despite pain. In such cases, pressures build and do not resolve with rest. Acute compartment syn­drome is a surgical emergency that can cause permanent impairment, muscle loss, paraly­sis, or limb loss if left untreated. Despite a lack of data on the predictive value of specific symptoms, expert consensus is that history plays an important role in diagnosis. Individuals are typically symptom free at rest. Exertion causes a dull achy pain and tightness. The pain begins in a typical man­ner after a set duration. It gradually increases in severity, forcing the individual to stop the activity. Pain and tightness subside within a few minutes of cessation. When symp­tomatic, the compartment may be palpably tense, like a drum. Some individuals also have neurologic symptoms including numbness, tingling, or weakness correspond­ing to the nerve in the affected compartment. If the lower leg is affected, anterolateral pain is most common, with a palpable tight fascial over the anterior or lateral compart­ments. If present, paresthesias occur over the dorsal aspect of the foot. If the anterior compartment is affected, ankle dorsiflexion may be weak. If the lateral compartment is affected, ankle eversion may be weak. If the deep compart­ment is affected, toe flexion may be weak, with numbness on the planar aspect of the foot. In contrast, individuals with stress fractures or MTSS have local­ised pain over the bone and not the soft tissues. In addi­tion, athletes with stress fractures and MTSS have pain at rest and pain with first impact but no delay in onset. Pre-exertion and post-exertion intra-compartmental pres­sure testing, in which a large bore needle is inserted into the compartment, is the gold standard for confirm­ing the diagnosis. Although it is unclear whether the examiner should assess all four compartments, both legs, or also assess 10 minutes after exertion, assess­ing the effect of exertion is essential (Whitesides & Heckman, 1996; Wilder & Magrum, 2010; Hislop & Tierney, 2011). Pressure can be measured using a needle manometer, a slit catheter, the microtip pressure method, a wick catheter, or microcap­illary infusion. Some techniques can measure pressures during exercise, whereas others require repeated needle placement before and after exertion. The Stryker Intra-Compartmental Pressure Monitor (Stryker Corp) is a handheld battery powered system with good reproduc­ibility between examiners (Glorioso & Wilckens, 2001). A five minute post-exercise pressure ≥20 mm Hg. Around 42% of orthopaedic surgeons in the UK use a pressure of greater than 35 mm Hg after exercise (sen­sitivity of 77% and specificity of 83%) (Tzortziou et al., 2006). Most surgeons insist on a positive pressure test before proceeding with surgery for CECS. Recent systematic reviews have ques­tioned these thresholds and recommended a more rigor­ous standardised process (Hislop & Tierney, 2011; Aweid et al., 2012). Alternative methods to confirm the diagnosis include near infrared spectroscopy and magnetic resonance imag­ing (MRI). Although not routinely available, near infrared spec­troscopy non-invasively measures tissue oxygen saturation in the relevant anatomic compartment; tissue oxygen satu­ration less than 50% has a sensitivity of 78% and a spe­cificity of 67% (Van den Brand et al., 2005). MRI measures changes in the T2 signal intensity at rest and after exertion. Unfortunately, this non-invasive approach has had poor diagnostic results compared with intra-compartmental measurements and near infrared spectroscopy (Van den Brand et al., 2005). If associated diagnoses, such as stress fractures or MTSS, are present, conservative treatment should be tried initially, although evidence for its effective­ness has not been validated in evidence based literature or comparative studies. This may include reducing or stop­ping the inciting activities – together with non-steroidal anti-inflammatory drugs, bracing, stretching, or orthotics as indicated – to target alignment anomalies, inflamma­tion, or stress fracture that may push an asymptomatic exertional compartment syndrome to a symptomatic one. Once symptoms resolve, the individual can gradually return to activity to assess whether symptoms recur. Anecdotal evidence suggests that conservative treatment is ineffective in most individuals with CECS confirmed by pres­sure measurements because they eventually require surgi­cal intervention unless they give up sport entirely (presumably due to the fact that they have continued training with this type of injury). Surgery usually entails subcutaneous fasciotomy via one or two small incisions. Anecdotal evidence suggests that this offers good to excellent results in 80-90% of patients, although the success rate decreases to 73% in cases of revision (Schepsis et al., 2005). More guarded out­comes might be expected in individuals with diabetes, incon­sistent symptoms, associated diseases, or deep posterior compartments (Fraipont & Adamson, 2003; Verleisdonk et al., 2004; Schepsis et al., 2005; Edmundsson & Toolenan, 2007; Lohrer & Nauck, 2007; Wittstein et al., 2010; George & Hutchinson, 2012). Fasciectomy or excision of a band of fascia is reserved for resistant or recurrent cases. Aweid, O., Del Buono, A., Malliaras, P., Iqbal, H., Morrissey, D., Maffulli, N., et al. (2012) Systematic Review and Recommendations for Intracompartmental Pressure Monitoring in Diagnosing Chronic Exertional Compartment Syndrome of the Leg. Clinical Journal of Sport Medicine. 22, pp.356-370. Clanton, T.O. & Solcher, B.W. (1994) Chronic Leg Pain in the Athlete. Clinical Sports Medicine. 13, pp.743-759. Edmundsson, D. & Toolanen, G. (2011) Chronic Exertional Compartment Syndrome in Diabetes Mellitus. Diabetic Medicine. 28, pp.81-85. Edmundsson, D., Toolanen, G. & Sojka, P. (2007) Chronic Compartment Syndrome also affects Nonathletic Subjects: A Prospective Study of 63 Cases with Exercise-induced Lower Leg Pain. Acta Orthopaedics. 78, pp.136-142. Fraipont, M.J. & Adamson, G.J. (2003) Chronic Exertional Compartment Syndrome. Journal of the American Academy of Orthopaedic Surgery. 11, pp.268-276. George, C.A. & Hutchinson, M.R. (2012) Chronic Exertional Compartment Syndrome. Clinical Sports Medicine. 31, pp.307-319. Glorioso, J. & Wilckens, J. (2001) Compartment Syndrome Testing. In: O’Connor, F. & Wilder, R. (eds). The Textbook of Running Medicine. McGraw-Hill. pp.95-100. Hislop, M. & Tierney, P. (2011) Intracompartmental Pressure Testing: Results of an International Survey of Current Clinical Practice, Highlighting the Need for Standardised Protocols. British Journal of Sports Medicine. 45, pp.956-958. Lohrer, H. & Nauck, T. (2007) Endoscopically Assisted Release for Exertional Compartment Syndromes. Acta Orthopaedic and Trauma Surgery. 127, pp.827-834. Pedowitz, R.A., Hargens, A.R., Mubarak, S.J. & Gershuni, D.H. (1990) Modified Criteria for the Objective Diagnosis of Chronic Compartment Syndrome of the Leg. American Journal of Sports Medicine. 18, pp.35-40. Schepsis, A.A., Fitzgerald, M. & Nicoletta, R. (2005) Revision Surgery for Exertional Anterior Compartment Syndrome of the Lower Leg: Technique, Findings, and Results. American Journal of Sports Medicine. 33, pp.1040-1047. Shah, S., Miller, B. & Kuhn, J. (2004) Chronic Exertional Compartment Syndrome. American Journal of Orthopaedics. 33, pp.335-341. Styf, J. (1988) Diagnosis of Exercise-induced Pain in the Anterior Aspect of the Lower Leg. American Journal of Sports Medicine. 16, pp.165-169. Tzortziou, V., Maffulli, N. & Padhiar, N. (2006) Diagnosis and Management of Chronic Exertional Compartment Syndrome (CECS) in the United Kingdom. Clinical Journal of Sport Medicine. 16, pp.209-213. Van den Brand, J.G., Nelson, T., Verleisdonk, E.J. & van der Werken, C. (2005) The Diagnostic Value of Intracompartmental Pressure Measurement, Magnetic Resonance Imaging, and Near-infrared Spectroscopy in Chronic Exertional Compartment Syndrome: A Prospective Study in 50 Patients. American Journal of Sports Medicine. 33, pp.699-704. Verleisdonk, E.J., Schmitz, R.F. & van der Werken, C. (2004) Long-term Results of Fasciotomy of the Anterior Compartment in Patients with Exercise-induced Pain in the Lower Leg. International Journal of Sports Medicine. 25, pp.224-229. Whitesides, T.E. & Heckman, M.M. (1996) Acute Compartment Syndrome: Update on Diagnosis and Treatment. Journal of the American Academy of Orthopaedic Surgery. 4, pp.209-218. Wilder, R.P. & Magrum, E. (2010) Exertional Compartment Syndrome. Clinical Sports Medicine. 29, pp.429-435. Wittstein, J., Moorman, C.T. & 3rd, Levin, L.S. (2010) Endoscopic Compartment Release for Chronic Exertional Compartment Syndrome: Surgical Technique and Results. American Journal of Sports Medicine. 38, pp.1661-1666.